After two weeks in Johannesburg, staying in a guest house, and working with some inter-city agencies to promote healthy living/life styles, it was time to finally leave mid-South Africa and head to the coast at Cape Town. 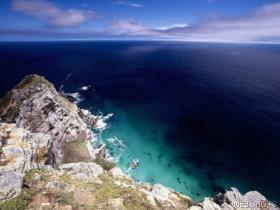 This has been a long awaited part of the journey, to see the Cape of Good Hope! I am excited about this final phase of my journey, and what a better way to end the journey a phrase that I can use when I return to witness my experiences--Good Hope! Tertia, Wellness Africa Director in the Pretoria area, received some additonal packages sent by donations provided through the efforts of mom and others interested in the AIDS orphanage. You can continue to support the Ziva Bantwana Orphanage by sending donations to Wellness Africa, c/o Helen Brockett, 6998 Point East Dr., Fayetteville, NC 28306. Mom is continuing to FedEx packages as the funds are available. Thank you to all who believe and pray to our awesome God!! Blessings will be shown to you!